A story of 30 Malay women and 3 proto-European men. This is not the plot or character list for a pornographic (though it might be an interesting one) but instead a story of human evolution, migration and settlement. 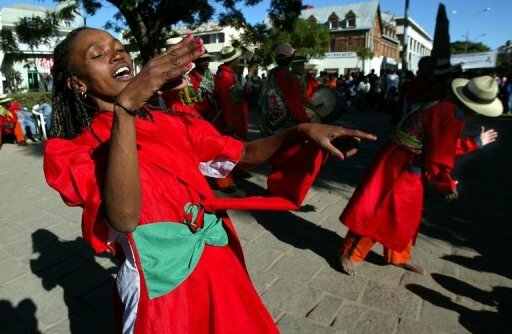 In this file photo, a Malagasy traditional singing and dancing group is seen performing in the streets of Antananarivo, in 2002. A team led by molecular biologist Murray Cox of New Zealand’s Massey University delved into DNA for clues to explain the migration riddle. They looked for markers handed down in chromosomes through the maternal line, in DNA samples offered by 266 people from three ethnic Malagasy groups.Twenty-two percent of the samples had a local variant of the “Polynesian motif,” a tiny genetic characteristic that is found among Polynesians, but rarely so in western Indonesia. In one Malagasy ethnic group, one in two of the samples had this marker. If the samples are right, about 30 Indonesian women founded the Malagasy population “with a much smaller, but just as important, biological contribution from Africa,” it says. The second is how the majority of European men can trace their lineage to just three male ancestors. A new study, also conducted by tracing DNA, added a piece to the puzzle: the Y chromosomes of the majority of European men can be traced back to just three individuals living between 3,500 and 7,300 years ago. 2 Responses to A story of 30 Malay women and 3 proto-European men. I find this recent DNA tracing so interesting. Nice post. Stan– I’ve tried emailing you at gmail and yahoo. I still have the Comcast email.